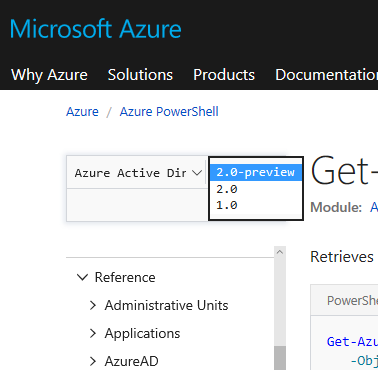 Today we are announcing the release of the PowerShell Module Browser, an easy, predictable way to search all Microsoft PowerShell modules and cmdlets. Back in April, we launched our first API Browser experience for .NET and the feedback from customers was that they loved the ability to easily find and search .NET APIs. We've now taken these learnings and applied them to PowerShell! The search results will encompass both individual modules, as well as cmdlets. In addition to adding a brand-new search capability for PowerShell modules, we also stay true to the spirit of docs.microsoft.com - always open for improvement and community contributions. Just like any other article, simply click on Edit and add your contributions to the Markdown file hosted on GitHub - once your change is approved, it will be live shortly! We want to hear your feedback on how we can make our PowerShell reference documentation more useful. Visit our UserVoice site and let us know how we can improve the PowerShell Module Browser experience. You can also reach out to us on Twitter for quick updates and questions.